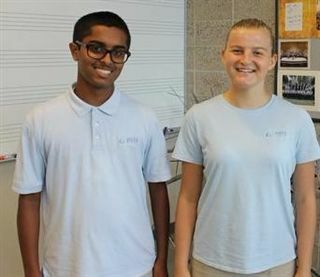 Congratulations to sophomores Rachael Bell and Anurag Aiyer on being selected for the National Association for Music Education's 2016 All-National Honor Choir. As part of the Mixed Choir Ensemble, Rachel and Anurag will join top high school musicians selected for the Concert Band, Symphony Orchestra, and Jazz Ensembles for a November performance at the Gaylord Texan Resort and Convention Center in Grapevine, Texas. They will be conducted by Anton Armstrong, Tosdal Professor of Music at St. Olaf College in Minnesota.